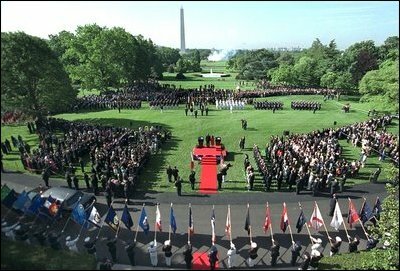 Flags are raised high as President George W. Bush hosts a State Arrival Ceremony for President Gloria Macapagal-Arroyo of the Philippines on the South Lawn Monday, May 19, 2003. "The Philippines was the first democracy in Asia and has a proud tradition of democratic values, love of family and faith in God. President Arroyo, you are carrying this tradition forward, and I'm proud to call you friend," said President Bush in his remarks. "Today the First Lady and I are honored to welcome you and Attorney Arroyo to America and to the White House. Mabuhay!"